That we're in the midst of a profound change in the energy markets in unquestionable. However, fossil fuels still remain the default medium of choice. Within those broader confines, the oil market is seeing a supply-driven correction of the sort that probably occurs once in a few decades. Meanwhile, peak oil theorists are in retreat following in the footsteps of peak coal theorists last heard of during a bygone era. However, what does it all mean for the wider energy spectrum, where from here and what are the stakes? 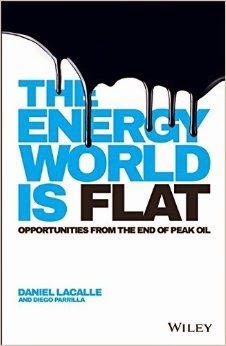 Authors and industry experts Daniel Lacalle and Diego Parrilla have attempted to tackle the very questions in their latest work The Energy World is Flat: Opportunities from the end of peak oil (published by Wiley). In a way, the questions aren’t new, but scenarios and backdrops evolve and of course have evolved to where we currently are. So do the answers, say Lacalle and Parrilla as they analyse the past, scrutinise the present and draw conclusions for future energy market pathways. In this book of 300 pages, split by 14 interesting chapters, they opine that the energy world is flat principally down to "ten flatteners" along familiar tangents such as geopolitics, reserves and resources, overcapacity, demand displacement and destruction, and of course the economics of the day. Invariably, geopolitics forms the apt entry-point for the discussion at hand and the authors duly oblige. As the narrative subtly moves on, related discussions touch on which technologies are driving the current market changes, and how they affect investors. Along the way, there is a much needed discussion about past and current shifts in the energy sphere. You cannot profit in the present, unless you understand the past, being the well rounded message here. “New frontiers” in the oil and gas business, today’s “unconventional” becoming tomorrow’s “conventional”, and resource projections are all there and duly discussed. To quote the authors, the world has another 1.5 trillion barrels of proven plus probable reserves that are both technically and economically viable at current prices and available technology, and another 5 trillion-plus barrels that are not under current exploration parameters but might be in the future. Furthermore, what about the potential of methane hydrates? Politics, of course, is never far from the crude stuff, as Lacalle and Parrilla note delving into OPEC shenanigans and the high stakes game between US shale, Russian and Saudi producers leading to the recent supply glut – a shift with the potential to completely alter economics of the business. What struck the Oilholic was how in-depth analysis has been packaged by the authors in an engaging, dare one say easy reading style on what remains a complex and controversial discussion. For industry analysts, this blogger including, it’s a brilliant and realistic assessment of the state of affairs and what potential investors should or shouldn’t look at. The Oilholic would be happy to recommend the book to individual investors, energy economists, academics in the field and of course, those simply curious about the general direction of the energy markets. Policymakers might also find it well worth their while to take notice of what the authors have put forward. © Gaurav Sharma 2015. © Photo: Front Cover – The Energy World is Flat: Opportunities from the end of peak oil © Wiley Publishers, Feb, 2015.